A strong and vibrant Christian education program lies at the heart of a growing church. No matter what the philosophy or approach to education, no program can flourish without skilled and dedicated teachers. While some such teachers are born, Israel Galindo believes that many others can be made. • What is unique about Christian education? • Are some approaches to Christian teaching more appropriate than others? • Is there a different way of learningnot just information gatheringthat impacts faith matters? 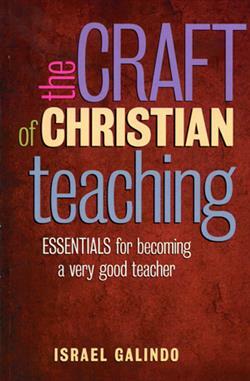 • What skills does the teacher need to possess for effective instruction in the church? Israel Galindo is dean and professor of Christian Education at the Baptist Theological Seminary in Richmond, VA. He has written twelve books, including The Craft of Christian Teaching (Judson Press), and The Hidden Lives of Congregations, (Alban Institute) which was selected as one of the "10 best books of 2005" by the Academy of Parish Clergy. Galindo is Executive Director of Educational Consultants (www.galindoconsultants.com). A frequent seminar and workshop presenter, he also serves on the faculty of the Leadership in Ministry Workshops, a clergy training program. Dr. Israel Galindo, Doctorado en Educación,es decano y profesor de educación cristiana en Baptist Theological Seminary en Richmond, VA. El Dr. Galindo es autor de 12 libros, entre otros El Arte de la Enseñanza Cristiana (Judson Press), yThe Hidden Lives of Congregations, (Alban Institute). El Dr. Galindo es Director Ejecutivo de Educational Consultants (www.galindoconsultants.com). Ofrece seminarios y talleres con mucha frecuencia y también forma parte de la facultad de Liderazgo en Talleres para el Ministerio, un programa de capacitación para pastores y pastoras.